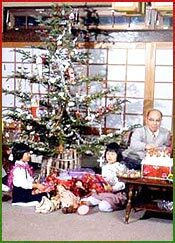 The celebration of Christmas in Japan is quite different from western countries like US and Australia in which the population has a large percentage of Christians. The major religions in Japan are Buddhism and Shinto and the estimated population of Christians is only ½ of 1%. Inspite of this, Christmas is a popular festival in Japan. The main celebration of the festival revolves around Christmas eve and not Christmas day. Though December 25th is not a national holiday in Japan, Japanese tend to celebrate Christmas especially in a commercial style. People of this coountry celebrate this festival by eating a 'Christmas cake'. One can find many variety of christmas cakes on this occasion. In recent years, the Christmas Chicken Dinner has become quite popular because of the marketing prowess of the folks at Kentucky Fried Chicken. Many people even make reservations for their "Christmas Chicken" in advance. People line up at their outlets to pick up their orders. As a result of KFC's brilliant advertising campaign, most Japanese now believe that Westerners celebrate Christmas with a chicken dinner. The event has been hyped by the T.V. media as being a time for romantic miracles. It is a day to be spent with one's boyfriend or girlfriend in a romantic setting, so fancy restaurants and hotels are often booked solid at this time. It is also a time to reveal your affection to your loved ones. Because of this, extending a girl an invitation to be together on Christmas Eve has very deep, romantic implications. Exchange of cristmas gifts is common among Japanese on this occasion. Within the family parents give presents to their children, but the children do not give presents to the parents. Reason behind this is that only Santa bring presents for all, so once the children no longer believe in Santa the presents are no longer given. Like US and Australia, families also have a Cristmas tree on this occasion and now having lights on the outside of house has become more popular. The month of December is the bounenkai season (forget-the-year-party) in Japan. Hence, Christmas parties tend to be mixed up with bounenkai. Many people can be seen on the street on December nights in Japan. For the people of Japan, Christmas is an enjoyable day in the year.